Mission SX3 review | What Hi-Fi? Take one look at the Mission SX3s’ cabinet and it’s clear a lot of thought has gone into the design. While some manufacturers (Acoustic Energy, for instance) go for the whole minimalist thing, there’s a lot going on here. For starters, they are beautifully put together. The black veneer on our review sample was applied with care and feels very professional – and then there are the curves – lots of them, which are there to reduce internal standing waves. We think it looks nice, lending the speakers a touch of elegance over their typically square-edged competitors. At the front you find two 13cm aluminium cones for midrange and bass. Sitting between these is a 25mm titanium-dome tweeter. The back, meanwhile, features a reflex port and two pairs of speaker terminals. Inside, interleaving layers of wood have been glued and pressed at high temperatures for 48 hours, and then left to cool naturally – a process that supposedly renders the cabinet acoustically inert. Very fancy stuff, but unfortunately it doesn’t prevent the Mission SX3s from giving an unexceptional performance. There’s nothing disastrous, but equally there’s nothing particularly great here. It’s a clear sound, with plenty of detail. Tonal balance is fine – you won’t be preoccupied with any part of the frequency range. But the sense of timing feels a bit slack, and there’s no real sense of dynamism either. It doesn’t help that integration is a little off – the bass feels a bit disjointed. Put these together and you don’t really get much excitement. We listen to Of Monsters And Men’s Dirty Paws, and the opening guitar section feels ponderous, keeping up with the piece but never propelling it. What we really want is a bit of exuberance, but we never get it. It doesn’t get much better as we crank it up. The sound hardens when pushed, losing composure and getting a little coarse instead. 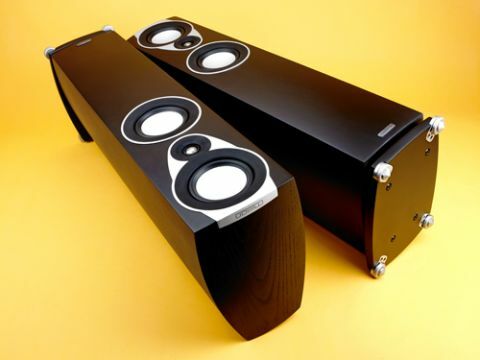 Mission says these speakers were designed to work well in a variety of placements. In practice we found them not too co-operative when given too much free space. They definitely prefer to be near, though not right up against, a wall, which helps firm up the performance to a degree. We find ourselves frustrated with the SX3s. They’re good-looking and well built, and we had high expectations after testing their standmount siblings, the four-star SX1s and five-star SX2s. Sadly, these speakers meet the minimum standard we’d expect at this price, but the same money spent elsewhere can get you better sound.